This past Labor Day weekend I decided to climb South Hill and try and find the three tiered mound on the side of the hill I found there years ago. Unfortunately, we were not able to find it. But we did some very interesting in an area now dubbed the Settlement. It was named the Settlement because it looks like people lived there, or had built some buildings there at one time. Yet the vibe and placement of certain stones indicate that it was most likely an ancient Native American (Adena) sacred site long ago before becoming a settlement. The picture above clearly looks like a foundation. The picture above is a long retaining retaining wall on the side of the hill. The retaining wall has several metal objects connected or embedded in it, indicating it is at most 100-200 years old. The picture below shows that there is another life, or previous life (?) to the retaining wall. The red and white poll shows the wall to be a little over 5 feet tall. The backpack marks the location of an energy vortex, or what I call a natural vortex. Because it forms in response to prayer/meditation/ceremony it is an indication that spiritual activities took place in the area. The retaining wall above is also situated on a series of 3 Earth Chakras. It could be coincidental, but given the natural vortex it is highly unlikely. The air is very charged. Further boosting the notion that the Settlement was once a sacred area is a smaller retaining wall in front of the larger wall below it. It also covers Earth Chakras. Clearly the Settlement was once a native American sacred site. It was odd and interesting to find that a large retaining wall would be built where once previously was. I spent Sunday of July 4th weekend, 2016 surveying for and praying at sacred stone mounds at Bristol/Brink Hill at Hi Tor. Found several store mounds, the most interesting was a large mound that is the most intricate stone structure I have found there. The pictures do not do justice to the mounds. 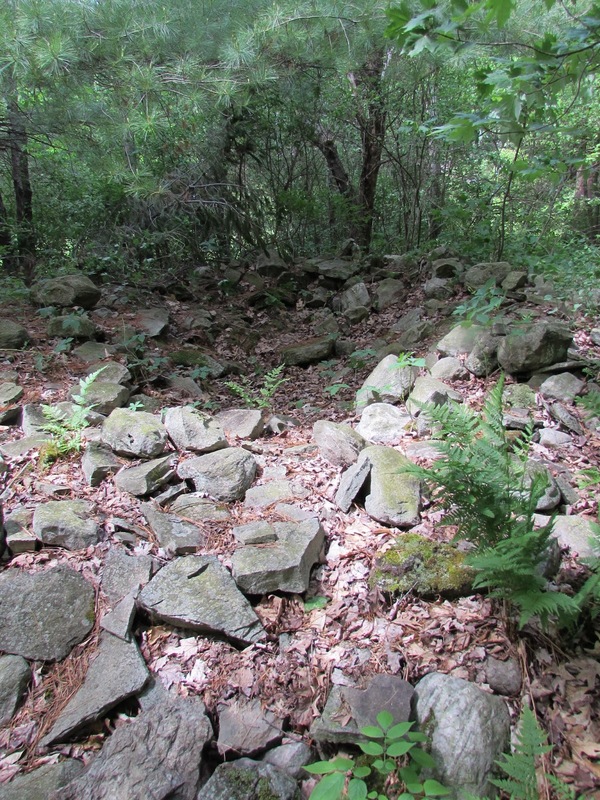 The picture below is of stone mound marking the intersection of 5 Spirit Lines (Ley Lines.) As the picture shows it is covered with fauna. It is not in great shape but you can make out the shape of a circle 16-18 feet in diameter about 2 feet high. Below are pictures of the intricate stone mound. The mound is a 20 feet long and oblong in shape with a sunken center; it is about 2-3 feet high. 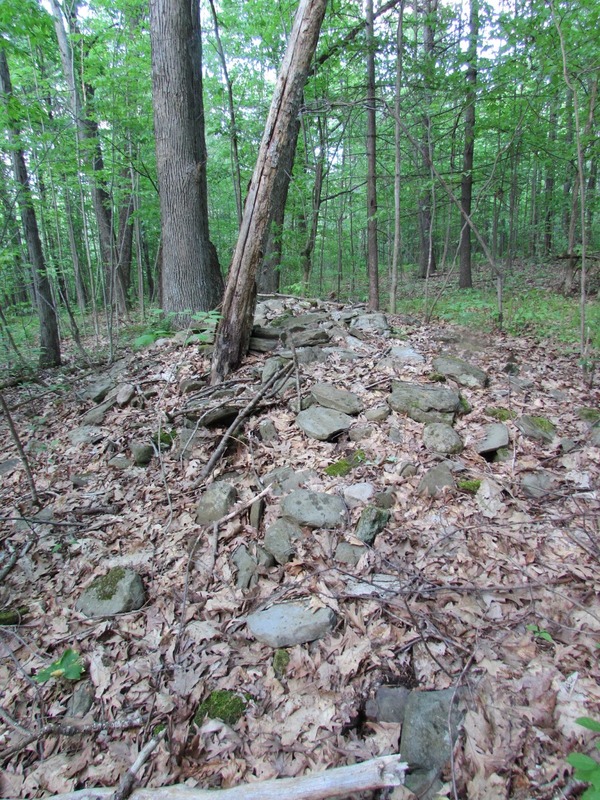 What makes this stone mound, or mound area so interesting is that there are three stone lines--or large stones 1-2 feet in diameter in the shape of a straight line next to it. 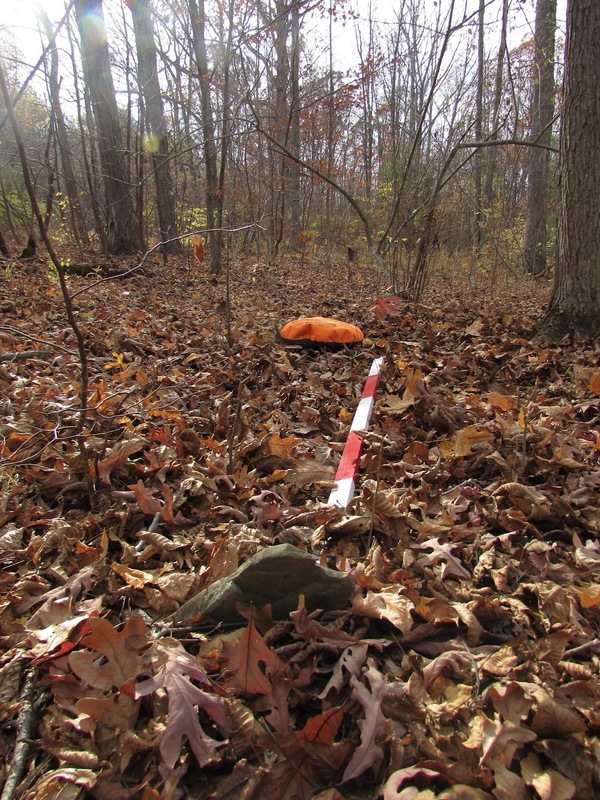 There are also two earthen mounds, of smaller size, about 3-4 feet high within 20 feet of the stone mound. All of the stone structures covered features of Mother Earth's Energy Plane; energy lines, earth chakras, etc. The ether was thick with energy around the stone mound area. My ajna chakra was electrified giving me a slight headache. It was all a little bit too much for me. Below is a picture of one of the three lines of stones next to the stone mound. The stones are heading to the tree. 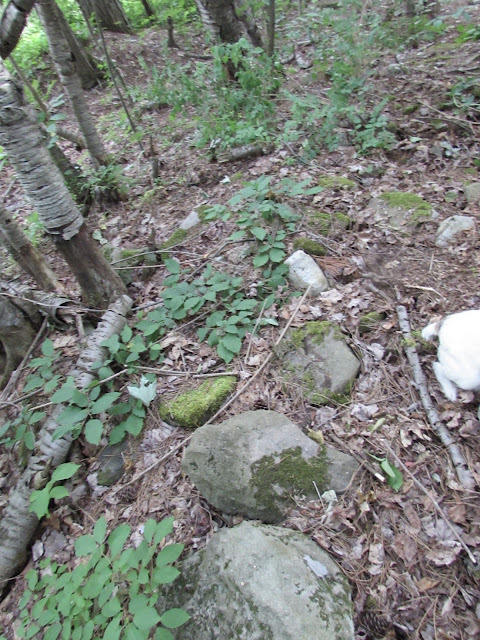 Another view of the stone line in relation to the stone mound. One of the other line of stones. There cut horizontally a little below the center of the picture. A line of stones with smaller earthen mound in the upper left. 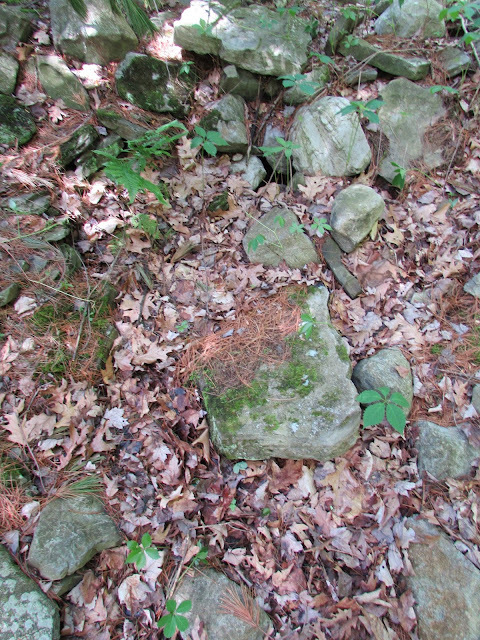 Below my backpack is in the sunken, or dimpled center of the stone mound. The larger earthen mound below. The picture below is of the smaller earthen mound (backpack on it and Pepper in front) relative to the larger stone mound. We found this mound later in the day. Before that the survey had been not too fruitful. It turned out to be a fun day. I was charged for the drive home.